NOTES: Cutter is another common early driver that isn't really that hard to find and shouldn't cost too much money. You won't have to pay a lot partly because he came with no accessories. Look for an undamaged Boston Red Sox "B" on his baseball cap. Also take not that this is another figure that can have discolored plastic, especially the blue of his shirt. 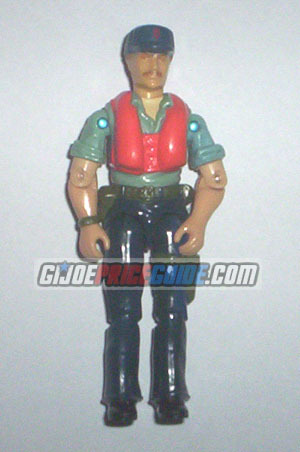 Cutter was the pilot of the GI Joe W.H.A.L.E. hovercraft.